This story was reported by James Aker, Corey Holbert, Tyler Gianlorenzo-Leach, Brittany Rhea, and Gwendalynne Kay Steinecke. Tarleton patrol sergeant Clell Murray has taught Civilian Response to Active Shooter Events, or C.R.A.S.E, classes on campus to help faculty and staff prepare for what was once unthinkable. 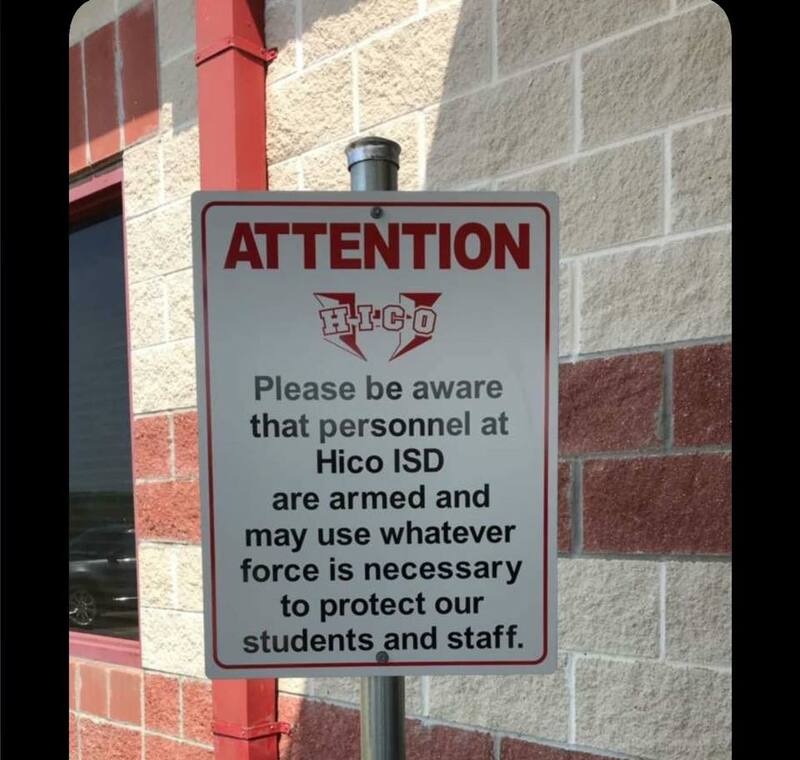 In Hico, Superintendent Jon Hartgraves says his two-campus district recently added a second school resource officer “so we’ll to have that (an armed officer) on both campuses.” They’re instructing teachers on how to barricade classroom doors rather than just locking them. Hartgraves says they’ve also installed buzz-in systems on both campuses. Security cameras record what’s going on outside the schools, and to get in, he said, “you must buzz in and a camera immediately goes to the person being buzzed in,” They’re also installing safety glass in the school office and a lock that is bolted to the doors of each classroom, he said. They’re also asking students to help protect themselves, their classmates, teachers and staff. Students can download an app to their phone and “report anything that’s concerning” anonymously, he said. He said the district is taking some precautions that aren’t good policy to discuss. Schools around Texas have posted signs similar to this one at Hico ISD. Photo courtesy of Jimmy Tomlinson Jr.’s Facebook page. “Some of those things we publicize and some of them we don’t publicize because it could obviously hinder our efforts to keep our campuses safe,” Estes explained. Some say they simply don’t have everything they need to take every precaution. Tarleton has never had an active shooter on campus. But a student with a concealed handgun license last year did accidentally discharge a firearm he was cleaning in his room in Integrity Hall. He called 911, reported the incident. No one was injured. Also, last year, there was a momentary panic that a shooting was underway when someone posted to Tarleton’s Facebook that there were “shots fired” on campus. The posting was a mistake. The May 18 shooting at Santa Fe killed eight students and two teachers. A 17-year-old student at the school, Dimitrios Pagourtzis, was arrested for the shooting. Before his Facebook page was removed, CNN reported that he had posted a picture of himself in a custom black t-shirt with the words: “Born to Kill.” He was indicted for capital murder earlier this month. In interviews this summer, two students and Welch each used the same three words about the likelihood of a similar tragedy striking the Tarleton camp.